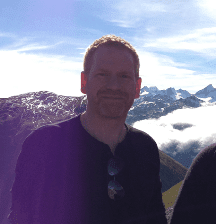 Parenta Trust: Andy and the furry Volvo – rallying to raise money! When I was invited to take part in the inaugural Maidstone to Monaco run in September 2013, I jumped at the chance, just knowing that it was going to be a fantastic adventure. If I am honest, the true purpose of the trip didn’t really factor in that decision; the idea of driving with my buddy and a group of like minded people down to Monaco on some of the world’s best driving roads was enough to hook me. What I didn’t know at the time was what a truly magnificent life changing journey it was going to be. So, the challenge was to put a team together (in my case it was just me and my pal Andy), buy a car for around £400 and get it to Monaco and with luck, back too, whilst raising £1,000 per team to build a pre-school in Uganda. Easy, or so I thought! The fun began weeks before, searching the usual internet sites for suitable cars. After looking at everything from old ice cream vans to “classic” Mercedes with stellar miles, Lady Luck smiled on us and eBay came up trumps with a 1997 Volvo T5 that had previously been used for a similar charity run and was already festooned in, of all things teddy bear fur! 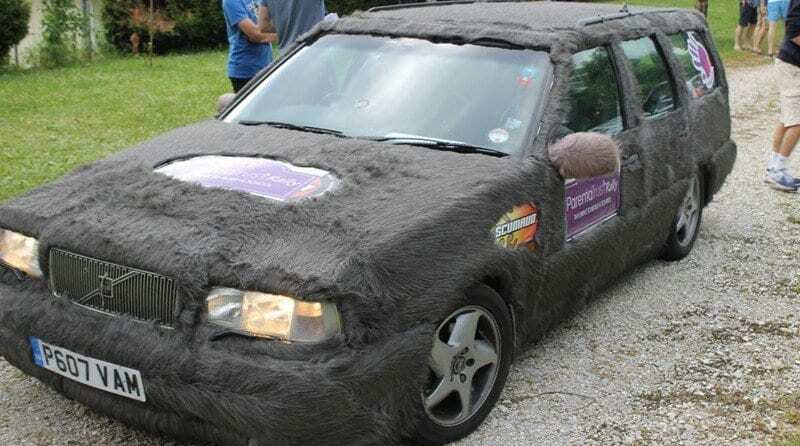 Team Andy and the Furry Volvo were born and, after a little fettling, were ready to take on the world! As it transpired, raising the £1,000 sponsorship turned out to be easier than we imagined. Once word got out of what we were doing, I was overwhelmed by the support and generosity of friends, family and work colleagues and even before we set off, the cash was in the bank. The real trip began on a sunny Wednesday morning. Meeting at the Parenta premises in Maidstone, we signed away our lives and shook hands with the other mad players, some of which had gone to the effort to dress up in garb to match their cars. In additional to the Furry Volvo there was a motley collection of a dozen cars that included Batman and Robin in the Bat Mobile, The A Team in a suitably festooned van and characters from Grease in a very un-Grease like Vauxhall Vectra! First stop Dover and a ferry to the continent. No casualties so far! The first day was a 360 mile blast through France, Belgium and Luxembourg, a quick skirt into Germany and on to our first stop at a campsite back in France. Little did we know this was going to be the only day on fast roads, just to get us far enough south for the real fun to start the following day. One broken exhaust, one speeding ticket and one customs search…not bad for a first day. That first night we pitched tents in the dark and as the cars dribbled in, beers and wine were consumed (in moderation of course!) and great friendships were born. Day 2 started early with the sun shining (it stayed that way for the rest of the trip) and spirits were high. Less miles to travel that day just 290, but the roads became more “interesting”. From France we entered Germany (again), through the Black Forest then into Switzerland and the Alps. That second day was a long climb up and we conquered the legendary Furka pass. If Hannibal and his elephants could do it, there was no way we would fail! That road in itself was the driving highlight for me and was worth all the effort alone. The best however was yet to come. Day 3 we travelled back into France along winding mountain roads and found time to stop for lunch at Chamonix and an unplanned cable car ride to the summit of Mont Blanc. Tired and high on emotion, it genuinely felt like we were on top of the world in every sense. Vin blanc on Mont Blanc and we were on our way again through the famous Mont Blanc tunnel and into Italy, before driving back into France for a slap up camp site gastronomic delight; by this time we were all tired of dining on tinned gruel and pushed the boat out, some of the more well prepared amongst us even found champagne to quaff! Day 4 was a final push through the Alps heading down to Digne and into Monaco. I don’t mind admitting that as we entered the principality in cars that couldn’t have been more different to the Bugattis, Ferraris and Bentleys, I might have choked back an emotional tear. We had all made it and even managed to take in part of the famous grand prix circuit in our trusty old bangers. That night we celebrated in style, feeling like the kings and queens that for that moment we were. Final day was an 800 mile toe down slog back along French motorways aiming to get a ferry back to Blighty sometime that night. With 600 miles to go the Furry Volvo decided to play hardball and sprang an oil leak. 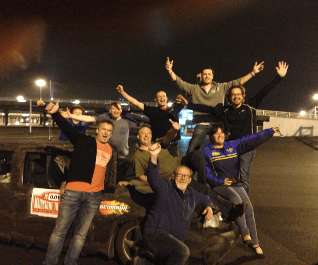 That’s when the friendships and camaraderie built up over the previous days really showed and pulling together we all made it back to Calais in time to catch the last ferry home. Arriving at Calais and knowing that we had prevailed despite all the odds, we were all winners. Just look at the smiles, they tell the whole story. Since that last trip I have been privileged to join the board of Parenta Trust. We will be running a second Maidstone to Monaco rally in 2014, so if you want to come along for a trip of a lifetime and help change the lives of children in East Africa, then sign up now. I promise you won’t regret it! This year’s event is happening on 25-29 June. To get involved, register your interest and we’ll be in touch! Hi Louise, thanks for your interest. It was great fun last year! We’ll send you a pack by email shortly! Do you have a pack with more information that I can have?